This is the story of the cantankerous cattle baron whose wife has just returned from the East after a two-year separation. This refined lady wants a divorce and custody of their 17-year-old daughter, who has been away at school and holds her Mother's distaste for all things "Western." The legendary star's most popular and successful films of the '60s. It's conventional, it's cliche-ridden, but it's fun. Heavily laced through and through with The Duke's brand of jingoistic Americana, this family production is little more than a good ol'boys tailgate party, only it's out west. "You know yer a redneck when ... " The naivete is nonetheless charming. John "The Douche" Wayne stars in a western comedy that takes place in a town full of one-dimensional, goofy characters. It's basically one "pie-fight" after another as The Douche tries to...ah who cares. Way more of a screwball comedy than a western, but it's great for what it is. 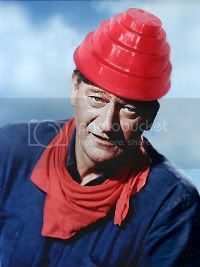 The Duke always has a great sense of humor, I really love his over-misogynistic portrayal of G.W. Him and Maureen O'Hara always have great chemistry together and truly feel like a couple. It's got a really interesting message about relationships and gender roles that might appear obvious, but there's multiple ways you can interpret it. Katherine McLintock: [after walking out of her bedroom to find G.W. and Mrs. Warren at the bottom of the stairs] What's going on here? George Washington McLintock: [Intoxicated, with Mrs. Warren sitting on his lap] Now Katherine, are you going to believe what you see, or what I tell you? George Washington McLintock: Agard, if you knew anything about Indians, you'd know that they're doing their level best to put up with our so-called 'benevolent patronage' in spite of the nincompoops that've been put in charge of it! George Washington McLintock: [after falling down the stairs for a third time] Drago, I am sleeping in the den!